I am fully aware that the Royal Ontario Museum will celebrate “Iranian Heritage Day” this coming May 26, 2012. However, Iran’s heritage is not the issue. The issue is that government properties – and the properties of tax-funded organizations – ought never to be permitted to be used as places of organized religious worship. The Royal Ontario Museum is a tax-funded agency of the Government of Ontario. It is also a charity. If the report concerning the call to prayer on May 21st is true, immediate steps must be taken by the government of Ontario to outlaw any further use of the Royal Ontario Museum’s premises – and those of any other tax-funded organizations – as places of organized religious worship. It is particularly concerning that the ROM’s call to organized Islamic prayer comes just two days following a reported May 19, 2012 protest held outside of the ROM – opposite the Israeli consulate at 180 Bloor Street – in which protestors gathered in late support of an annual “Nakba Day”, which is a commemoration of what pro-Palestinian activists call a “Day of Catastrophe”: the 1948 Israeli Declaration of Independence. To many onlookers, it would appear that the ROM’s alleged decision to allow the ROM to be used as a place of organized Islamic prayer was an appeasement that resulted from an anti-Jewish or Anti-Israeli protest outside of the ROM two days earlier. Democracy entails a belief that the government is accountable only to the individuals it governs: not to any person’s god. Democracy demands that no person or organization be permitted to use government-owned or tax-funded properties as places of organized religious worship, and that the government not directly or indirectly subsidize religious activities. 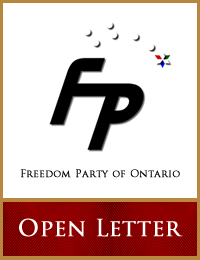 On behalf of all Ontarians who do not want government property or taxpayer funds to be used to support any particular religion, I am calling upon the government of Ontario to lay down strict prohibitions preventing tax-funded organizations – such as the ROM – from allowing organized religious practices to be conducted on their properties. The people of Ontario want to know what the government will do to prevent Ontario’s tax-funded organizations from using their funds or properties for the support of organized Islamic prayer and other religious practices. I am calling upon the Premier and the Minister of Minister of Tourism, Culture and Sport to investigate the alleged May 21, 2012 incident at the ROM, to report to the public on what occurred, and to issue directives to all organizations receiving support from the Government of Ontario to the effect that their funding will be discontinued should they permit their properties to be used for organized religious practices such as prayer sessions.